The reactions to the events in Bet Shemesh have been interesting and revealing. They also show how Jews in the US are out of touch with Bet Shemesh. The OU and RCA issued an unequivocal condemnation of the kanna'im, along with urging everyone to recognize that "the vast majority of Charedi Jews find these actions abhorrent." The local Bet Shemesh charedi weekly newspaper Chadash, which effectively represents the Mayor and his council (it is owned by their spokesman), had a very different reaction. On the front page, in a gigantic headline, it screamed "THE BLITZ." Under that, it stated that the Charedi residents of Bet Shemesh have become a target of "redifah" (persecution), "the likes of which have never been seen." Really? Have they been spat on? Have they had stones thrown at them? Have they had their flags stolen? Have they had their cars vandalized? Have they had their social activities broken up? Have they had their businesses threatened if they don't put up certain signs? Have they had their kids beaten? No; that's only happened to hundreds of non-charedim here. 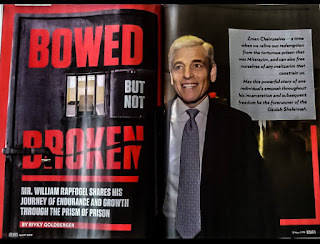 The entire "special issue" of Chadash contained article after article about the terrible, evil secular campaign against the Charedim, with each article including a graphic captioned "The city under attack!" Especially ironic was a half-page article about a Haaretz journalist who allegedly spat on a little girl (which he entirely denies). This is in a newspaper which never prints articles about the countless spittings and acts of vandalism and physical violence committed by local charedim against the national-religious. Even when there was a mob beating of kids which resulted in my neighbor's child requiring stitches in his head, the newspaper claimed that it was all the dati-leumi kids' faults! Likewise, in the early days of the violence against Orot, Chadash falsely claimed that there was no vandalism against the school, and claimed that the persecution was of the National-Religious against Charedim, who were "setting dogs on them" (which was completely false). The lead editorial rants on and on about the terrible, baseless persecution of the charedi population. It denounces the kippa-wearing people who brought the Orot situation to the attention of the wider public. It does not issue a single word of condemnation against the charedi thugs. Not one word! A later article in Chadash asks why the charedi population should be held responsible for the actions of a few extremists. I'll tell you why the very people behind Chadash should shoulder some of the blame. Because the people behind Chadash never, ever report about charedi wrongdoings or condemn them. Instead, they demonize and slander National-Religious people. In light of all this, the claims being made about how the actions of the kanna'im are entirely abhorrent to the vast majority of Charedi Jews are a little misleading. To the local Israeli charedim in Bet Shemesh, the actions of the kanna'im aren't anywhere near as abhorrent as the protests against them. "(The reactions) also show how Jews in the US are out of touch with Bet Shemesh." I'm not sure if you remembered to demonstrate this point in your post. I'd like to see you elaborate on this. "(Though they also spent even more words stressing that the cause of tzniyus is of great importance, inevitably leading many to wonder about the sincerity of their condemnation.)" I'm sure many people wondered about the sincerity of the Agudah's condemnation immediately upon seeing the word "Agudah" in the title. Is there a way to get this post of yours into the hands of the leadership of Chadash? If I lived near Bet Shemesh, I'd volunteer to do it myself. I'm not sure if you remembered to demonstrate this point in your post. It was in the last paragraph. Is there a way to get this post of yours into the hands of the leadership of Chadash? They probably don't read English. And, frankly, I don't think they'd grasp the point. I told you in the earlier thread that big demonstrations and a media blitz against Haredim extremism would push the moderate Haredim into the arms of the extremists and they would close ranks with them. The only solution is direct action. Have "unofficial" guards protect the girls coming to the Orot school who are willing to use force against the hooligans. This will force the police to provide the protection needed, even if they are reluctant to do so. Organize boycotts of Haredi organizations that turn a blind eye to this behavior. Tell Dati Leumi people not to donate money to those who support the extremists. Use your heads. Don't turn to those like the secular politicians who are going to exploit your legitimate protests for their own, unclean purposes. Rav Malinowitz speaks English and would grasp the point. How about if HE were to boycott the newspaper by not publishing his weekly divrei Torah in it? One positive point for Chadash newspaper - at least this week they didn't go the usual duplicitous route of making the Hebrew side full of sensationalist charedi victimhood screed, with the English side sporting totally different, parve, nicey-nicey content, which the sweet and nebach feeble Anglos can digest. Nope, this week Anglos too are invited to the "big boys table". Welcome to the charedi apologencia! David - it was never a matter of being duplicitous. They just didn't know what was appearing in the English side. The articles were subversive journalism by a renegade translator who has since quit! 1) The Israeli charedi mentality is one of 'circling the wagons' - for better or for worse. They take care of their own, and don't like outsiders butting in (even if one of the community does something that is wrong). The American community is much more open - in both of these senses. 2) The left wing in this country (and Tzipi Hotobeli) are using this as a chagiga to attack anything that has a whiff of charedi Judaism, and to that extent they are using classic anti-semitic caricatures - see this video as an example: http://www.youtube.com/watch?v=6Cy3wxs6Czs Be sure to have a bag to catch all of your vomit after you see it. 4) When I (who can probably be called a "moderate" charedi - or even by some "a kofer") have a choice between supporting bald muscular Israeli policemen vs. the residents of RBSA (the video has nothing to do with spitting on girls on the way to OROT) - you can be sure which position I will take. 5) Most of my Israeli non-charedi friends are laughing at the American "frierim" - namely Rabbi Dov Lipman who is playing directly into the hands of the left wing Israeli media and the left wing politicians. While Rabbi Lipman may be correct in trying to deal with a terrible situation, he is hurting religious Jewry in this country terribly. Do the sikrikim hurt it as well? Definitely. But what has happened is that a witch hunt has started against anything Jewish or religious, and Rabbi Lipman is adding gasoline to the fire. He obviously does not mean to do so, but it seems that he is a bit naive in how the way things work in this country. where "the son of a Rav" tells the reporter that "I will take an Uzi and kill 10 of them [charedim]". Who should we side with? The chilonim who want to kill us? Do you think that this fellow will spare you because you have a blog called "Rationalist Judaism"? I really enjoy your blog and respect you, but the nutjob who has been incited due to the leftist media couldn't care less. Even if they are (and I think that you are grossly exaggerating) - so what? You mean where the woman is holding a brick, ready to throw at the police? Yes, the police are brutal. So are several dozen/ hundred charedim here. What's your point? I don't even know what that means. Are you referring to a perfectly innocent resident of RBSA? Then we're on the same page. Or are you saying that you support charedi thugs who harrass others over the police who arrest them? Most of my Israeli non-charedi friends are laughing at the American "frierim" - namely Rabbi Dov Lipman who is playing directly into the hands of the left wing Israeli media and the left wing politicians. Actually it's the charedim who are playing into their hands. But in any case, it's only this huge explosive witch hunt that stands a chance of making the girls in Orot safe. If the general charedi public suffers as a result, it's their own fault. I don't think that the non-charedi religious public is going to suffer as a result. It reminds me of the terrible chillul Hashem caused by the media outlets which exposed child abuse in the Orthodox community. Sure, it was a terrible chillul Hashem. But it's the only thing that got people to deal with it. As usual, right on the money. Just validates what you wrote in your last post on the subject. I think that shows that for the local haredi establishment here, group identity is more important than any Torah values, unless we've finally gotten to the point where their perverted and extreme version of tziut has officially wiped out all other values. I wonder how many of those who are up in arms about Dov Lipman's campaign were equally up in arms about the problems that he is trying to solve. Did you bother to watch the video? The whole thing? I don't want to be the defense attorney for that woman, but had she wanted to bash in the head of the policeman she had plenty of time to do so when his back was turned. The police could simply have taken the brick away from her - they chose to act differently. In all, it is just פרשנות. You do realize that you are included in "the general Charedi population"? Unless you have gone Matisyahu on us and shorn your beard and started wearing a kippa sruga? Affiliation (to the standard Israeli) has to do with dress - not with hashkafos. I wear a blue shirt! But seriously - I would be more concerned about my life in Ramat Bet Shemesh if this campaign and reaction hadn't happened. I have not given an aliyah to a sikrik - nor counted him in a minyan for quite a few years. If Rabbi Lipman comes to a minyan that I daven at - I would gladly give him shlishi - even though I think that he is a bit naive regarding the Israeli media and politics. I skipped around, it was too disgusting. But I don't think that it represents more responsible people - certainly not Tzipi Hotovely. Yet all of my friends at Hebrew U identify me as charedi! The articles were subversive journalism by a renegade translator who has since quit! Fascinating! I assume you mean "subversive" in the sense of deliberately not translating the more insidious Hebrew content and thereby limiting the spread of their message. I wonder if this translator knew how absurd the disparity of content looked - that Anglos were intentionally kept in the dark to maintain the illusion of Israeli-charedi even-handedness and tolerance. Well, I guess that veil's been lifted (so to speak, that is :-). Take a look at crosscurrents. Not to many commentors agree with the Aguda statement. Almost all agree that condemnation should have been unequivocal. It's not American Jews out of touch with Beit Shemesh, its the Aguda being out of touch with their base. If life so bad in RBS, why don't you move? You can sell your place there to some American yeshivish family at a huge profit, buy elsewhere in the country with cash, and pocket the difference. The Orot Bonot school opened as planned on Thursday Sepember 1st in the new building with hundreds of police and even riot police present to prevent disturbances. Their presence kept extremists away and the school day was quiet for the girls. Unfortunately this past week has not been calm, and every day a large number of extremists have been gathering close to the school screaming insulting epithets such as “shikzah” and “pritzus” at the innocent young girls. The crying and frightened young school girls had to be escorted by parents and teachers past the intolerant fanatics while police look on. Concerned residents who asked the police why they can not take action to prevent the harassment received the response that the police can do nothing since “all they are doing is screaming”. In a counterattack on Tuesday moderate Charedim and national-religious scattered pashkevillim around the area where the fanatics live with some of their names and addresses and their pictures, questioning whether their participation in the haranguing of the little girls is pedophilic in nature. Meanwhile two schoolgirls learning in the second grade have filed a complaint with police against members of the sect, alleging that the men chased them after school, frightening them. In addition, a Beit Shemesh man who accompanied girls to school has accused members of the same sect of spitting at him. In response to the ongoing crisis the Beit Shemesh Municipality stated, "Unfortunately, we see the police's early forecast materialize. It's a shame that the national elements – like the Prime Minister's Office director-general, the Education Ministry and the Public Security Ministry, which lack knowledge of the local, delicate and fragile situation – chose to meddle in the neighborhood dispute and take a one-sided stand in the battle between the city's different populations, causing the reconciliation and bridging attempts launched by the municipality to fail. The Beit Shemesh Municipality condemns the violence and calls on both sides to stop the deterioration and return to the negotiating table in order to reach an agreement. At the end of the day, these people are neighbors and have no choice but to get along." Let it be duly noted that Rav Malinowitz is the rav of the English section. One thing to understand is that from the Dati Leumei side of this there were only two possible courses of action, surrender the school that they built and wait for the next round, or to fight back. First, expecting intelligent dialogue with the Chareidi side is not possible. If it was then your books would not have been banned. After all, when someone attacks you verbally and physically but then turns around and declares himself the victim he is either a pathological liar or in a state of delusion. Second, the Agudah condemnation was no such thing. If you read it again you'll see it can be summarized as: We agree with the fanatics' goals (and therefore don't think that Naama Margolis is dressed properly) but are worried that their tactics will lead to an inability to force those goals on everyone. Hardly encouraging. "Eizehu chacham, haroeh et hanolad" The consequences of this battle ought to be obvious to all; SOMEONE IS GOING TO DIE!!! And when that happens (and I'm as sure of that as I am that the sun rises in the east) all hell (mainly philosophic, but perhaps corporeal as well) will break loose. People aint seen nothing yet compared to what will happen to us as a nation of "rachmanim, baishanim and gomlei chassdim" when Jewish blood is spilt over a building in RBS, seating arrangements on a bus and the opaqueness of a pair of pantyhose. Everyone will blame everyone else, and in the end we will all have to admit that "Yadeinu shafcha et hadam hazeh." I for one don't know how I'll explain to my kids the importance of religion if a Jew kills another Jew over such BS. And one need not be all that smart to see it coming. We should all be praying that Netanyahu can act like a MIDDLE EASTERN LEADER and send in the IDF to FIX the problems and maybe LIKUD CAN BEHAVE LIKE A CONSERVATIVE PARTY and cut off the WELFARE PAYMENTS! Moshe, Anglos may not understand how the system "works," but they seem to be the only ones willing to challenge it to force change. As an Anglo in Chutz La'aretz I genuinely don't understand how to parse your objection. Are you saying change isn't needed? Or that some other method (direct violence? Continued appeasement?) is preferable to Anglos attracting media attention which attracts police attention? Now Cheif Rabbi Sacks weighs in. "it stated that the Charedi residents of Bet Shemesh have become a target of "redifah" (persecution), "the likes of which have never been seen." What they wrote is correct. All other redifos have involved much more than making sppeches and also did not include no-questions-asked checks in the mail on a regular basis and ongoing subsidies of the lifestyle that the rodfim object to. Yes, redifa like this is truly unique. Mi k'Amcha Yisroel, that you are rodef so mildly and with such generosity! The Agudah's "condemnation" was only disappointing to those who expected somethIng substantial from them. "Never be surprised when people act in character." I think this is the most important article I have read on this matter so far. Thank you for sharing. Just a minute there! Your parenthetical criticism of the Agudah statement is misplaced. The statement speaks about tznius in the context of additional condemnation of the kannaim! That this will result in the ideal of tznius becoming ugly and distasteful. "Unfortunately, we see the police's early forecast materialize. It's a shame that the national elements – like the Prime Minister's Office director-general, the Education Ministry and the Public Security Ministry, which lack knowledge of the local, delicate and fragile situation – chose to meddle in the neighborhood dispute and take a one-sided stand in the battle between the city's different populations, causing the reconciliation and bridging attempts launched by the municipality to fail. The Beit Shemesh Municipality condemns the violence and calls on both sides to stop the deterioration and return to the negotiating table in order to reach an agreement. At the end of the day, these people are neighbors and have no choice but to get along." President Eisenhower took a one-sided stand in 1957 when he sent the US Army to defend the black students who were trying to attend Little Rock Central High School. Elsewhere in the South, there were attempts to negotiate an end to mandatory racial segregation peacefully -- and those attempts went nowhere, because the segregationists used the negotiations as an excuse to delay and procrastinate. Only intervention by federal courts and the US Congress put the segregationists out of business. There is a similar parallel in Israel today. Hamas is perfectly willing to negotiate a peaceful final settlement -- as long as that settlement includes the airlift of almost every Jew in the region to somewhere else. Fatah has pretended to negotiate over and over again, always to refuse any reasonable offer. The few Palestinian leaders who actually work with Israel to improve the lives of their people such as Salam Fayyad get thrown under the bus; I suspect his publicly stated willingness to have Jews live in a Palestinian State may have been cause for the shove. Yes, I just compared the sikarim and their apologists to the Arab terrorists and their leaders. We should treat them the same. 1) Obviously the charedim are wrong in this case. 2) I think it's wise for a blog called Rationalist Judaism not to use hysterics. Being beaten is not a "lynch." That word is reserved for people who are killed. 3) I think social intimidation is acceptable at times provided that a community is long established and people know their customs. For instance, I think a woman wearing a tank top should be made to feel uncomfortable in the heart of Mea Shearim (not beaten or cursed at -- just made to feel uncomfortable). If the woman in question is intentionally flaunting the community's standards, then I think the community has the right to take even more drastic steps (although I agree that cursing and spitting are low class no matter the situation). 4) I agree that point 3) does not apply to the case in Bet Shemesh since, if anything, the "modern" crowd was there first and the charedim invaded. If anything, they should pay deference to the values of the city that they moved into. I (and I'm sure other readers) would very much like to hear more about your experience with Chadash, particularly any reflections about what we're truly up against and what you think can be done about it. Shavua tov & chazak ve'ematz! Frankly I think you are sounding as fundamentalist as those you criticize. I have personally witnessed many events of intimidation from anti-religious groups in RBS, including where I had to rescue a group of 7 year old hassidic boys who were being harassed by our 'street youth'. How many people have been spat at in the park by the these youth, for wearing black pants. We have a problem to deal with, but the problem is not one sided like you make out. You have a reputation for being level headed - this doesnt sound like you. The woman *flaunts* her tanktop. She *flouts* Meah Shearim. Ariel, actually it's the first time I've ever heard of such a thing. But I would note that there's a huge difference between acts committed by delinquent youth and acts committed by grown men. Ariel, it's sad that the difference is not abundantly clear. Nobody is asking them to apologize for it. We are asking them to condemn it. There isn't one mainstream haredi who supports what happened to that poor girl, and there isn't one mainstream haredi who doesnt believe crimes should be prosecuted. And there isn't one mainstream charedi rabbi in Israel who will issue the kind of condemnation of those acts that the RCA and OU issued (or even the weaselly condemnation that the American Agudah issued). Surely you know the effect of condemnation. If a particular rabbi's congregant does something that warrants condemnation, he should condemn it in the hope that the person will listen. If their congregants have nothing to do with it, ie. condemnation via proxy, that opens up a whole new can of worms. The organizations overseas are forced to condemn, as the way the media portrayed this event will affect their ability to raise funds. They are indeed (unjustly) blamed for this person's crimes. Putting this on world news was not the way to solve this problem, and in truth just made moderate haredim feel betrayed and attacked. Charedi rabbonim have never shown any reticence to condemn those outside of their immediate communities. Look at how many rabbonim in the neighborhood, including Anglos such as Rav Korneld, signed letters about non-tzanua women in the merkaz. You say that giving this wider exposure was not the way to solve it. Well, nothing else worked. And this might indeed mean more police and more pressure to solve it. When Baruch Goldstein murdered 29 Arabs, the Religious Zionist community largely raced to explain that he is not representative of the community. When Newsweek put a settler family on its cover that week with the caption, "Armed and Dangerous", religious Zionists were horrified that the entire community was being vilified for the actions of an individual. But Rav Norman Lamm said that we are ind...eed required to do cheshbon hanefesh, as we allowed certain extremist ideologies to coexist within our ranks for years without speaking out. Because those ideologies claimed to be representative of Religious Zionism, we had a moral obligation to say otherwise. The vituperation afterwards was, in a real way, our fault. When the secular media declares that the current issues in Beit Shemesh are a Chiloni-Chareidi problem, and the Chareidi community complains that they don't approve of the actions of the Kitzonim and that the media are unfair in their portraying the entire community without distinction, they similarly have only themselves to blame. By not speaking out until it became imperative to do so, they invited this defamation upon themselves. It would be nice to see a call for cheshbon hanefesh, rather than the complaints about the media, or the even worse claim that they have been at the forefront of the fight against the Kitzonim all along (see Ami magazine for a good example of this falsehood). Can someone here please explain how the treatment of Lema'an Achai by many "moderate" charedim in RBSA is considered acceptable? Last Pesach 30 banners of Lema'an Achai were systematically destroyed. "Moderate" charedi rabbis and shuls ban Lema'an Achai from coming into the shuls. Meanwhile the well oiled Charedi Kupa receives unconditional support and has a presence in all shuls including non Charedi ones. We're talking about tzedaka here. How and why do supposed religious Jews have a problem with Lema'an Achai simply trying to raise money? Control. The charedim want to run and own everything in RBSA,,,from the mikve to the stores to the tzedaka to the schools. As an Anglo in Chutz La'aretz I genuinely don't understand how to parse your objection. Are you saying change isn't needed? Or that some other method (direct violence? Continued appeasement?) is preferable to Anglos attracting media attention which attracts police attention? You bring up a number of important points. Change is needed. How to go about affecting the change is the question. The veteran Israelis know how the media in Israel is masterful in "guiding" public opinion. They use people - who are good and caring - in order to further their left wing agenda. In a couple of weeks - they toss them out with the trash. In other cases - they turn their vile and vicious agenda against the "moderates" who worked with them. The reason that the media (and many of the secular Israelis) are acting in such a way is fright - due to changing demographics. The elite ashkenazi secular upper class is no longer the guiding force in the country. They have lost their majority. The country is becoming more religious and more right wing. As a result, seculary oligarchies are trying to exert their power - the BaGatz and the media. Both are still run by secular ashkenazi liberals - and they are doing there best to make sure that things don't change. A number of bills are being put forth in the knesset to limit the "activism" of the Bagatz - and to limit the falsehoods of the media. The media circus started out bashing the Likud for "undemocratic" laws, and then continued on with right wing dati leumi bashing (soldiers in the army that don't want to be forced to hear women soldiers singing), settler bashing (the tag mechir blood libel), and now they have moved on to the charedi public. In each instance the media portrays a minority as trying to force their lifestyle on others (Hadarat Nashim; choosing new judges; charedi imposition on others). They don't bother to discuss how many people are involved, what the options are, how to work things out - they are only interested in spreading hatred and preserving their power and control. Right now, "the charedim" are the ones being persecuted (due to their own actions) - but no one in the media actually tries to calculate how many Toldos Aharon chasidim there are in RBS and who is involved - it is always "the charedim". As I wrote previously - the definition of a charedi in the eyes of a chiloni is the color and style of his yarmulka. As much as I (and other) disagree with the sikrikim - we all get tarred with the same mud. Rabbi Lipman may win the battle, but he'll lose the war. The media don't want him any more than they want the sikrikim. You can call me paranoid if you want, but that's how things work in this country. I am not charedi and I have little sympathy for the Agudah. Still, I fail to see why the Agudah or even other Charedim in Israel must apologize for the behavior of a small lunatic fringe charedi sect. If a violent group of black hoodlums from Brooklyn went on a crime spree, would anyone ask the NAACP to issue a condemnation? I am as horrified as anyone by what has gone on in RBS, and would be fine if the police used fire hoses or rubber bullets on these thugs. Still, this incident has been used to justify anti-charedi animus and even anti-religious animus. Witness the NY Times lumping this with religious IDF boys being bothered by kol isha. Be careful who you join up with this week. Some of them will be coming after you for your mechitzas in shul next. "3) I think social intimidation is acceptable at times provided that a community is long established and people know their customs. For instance, I think a woman wearing a tank top should be made to feel uncomfortable in the heart of Mea Shearim (not beaten or cursed at -- just made to feel uncomfortable). " Should Chareidim in their garb be made to feel uncomfortable (not beaten or cursed at) everywhere else besides their own neighborhood? "If the woman in question is intentionally flaunting the community's standards, then I think the community has the right to take even more drastic steps"
I agree. Charedim should be required to go to the army and work for a living or thrown in jail. Yehuda writes: "1) Obviously the charedim are wrong in this case." Shmuel G writes: "Control. The charedim want to run and own everything in RBSA"
What's with the definite article, "the"? R' Slifkin has carefully included, on several occasions, the modifier "minority" or "radicals" and the like. Kindly do the same. I think that the reason most of the charedi community does not to admit to these crimes happening is because of the enormous hypocrisy. How is it that these torah jews commit such atrocious acts? They see any attack against these hoodlums as attacks against charedism. It is quite obvious to me in fact that not acknowledging these crimes is clearly an example of the bystander effect. Rabbi Slifkin, here's where I think you're mistaken. I didn't read the whole comment thread but some of it, and I gather from your comments that you basically feel the problem with sikrikim and specifically the orot school issue was not being dealt with enough, and now with the magnifying glass on the issue and the whole public up in arms over it, it will cause this to get dealt with so people will be more safe. So in that case it wouldn't matter that its an orchestrated media lynching of haredim (and actually, Judaism in general) since it causes more safety etc. But I really don't think the govt is interested in your problems. I really do not think they want to fix it or legitimately care about you and "your people" or "your kind" in ramat bet shemesh. They have pounced on this issue for political gain. They like to see your kind suffer because they hate and are threatened by the national religious. They like to enflame the public against Judaism because they want the populace to be secular and stay that way, and they know it strikes a nerve in people, a very sensitive antisemitic kind of nerve, when they portray haredim a certain way, and whoever pretends they will be toughest on them will get more votes from a scared and largely ignorant public. If the govt cared about the Orot girls, that problem would have been fixed long ago. They are taking legitimate problems and legitimate issues and attaching things utterly unrelated and phony (such as a leftist' woman's provocation on a bus that she planned ahead of time) in order to create a national scandal to benefit themselves (doesn't everyone need Big Brother in their lives since we now face a national scandal? *rolls eyes). The national religious are the govt's favorite whipping boy (even more than arabs - way more, in fact). How can you possibly think they are on your side and trying to help you? I really don't see the benefit in morphing a public safety issue in ramat bet shemesh into a phony national crisis of "women's exclusion" starring the top likud footsoldier feminist tzipi hotovely aka "the one who shall upstage and bury the career of tzipi livni once and for all, if bibi's plan works"
"If a violent group of black hoodlums from Brooklyn went on a crime spree, would anyone ask the NAACP to issue a condemnation?" False analogy. Say the NAACP thought it was discriminatory for a particular university to use the color black in its insignia, and prominent NAACP members often spoke out against this university; some could even be found at protests where garbage bins were overturned, rocks thrown at the university's buildings, and university flags burned. Say that it was popular knowledge that some NAACP members began to throw bleach at people they saw wearing university paraphernalia; there was even a very public incident where someone wearing a university shirt on a bus was beat up. For years small similar events took place without official NAACP protest. One day an act of violence is caught on video and publicized in the media. When NAACP board members are asked about the event all they can say is that these are "extremists who don't represent our views" while stressing that, in any case, the university was using the color black which shouldn't happen. You think the NAACP is handling the situation appropriately? The point is this: the NAACP and "black hoodlums" have nothing to do with each other. The beit shemesh nutjobs, however, belong to a larger group, fight for the group's goals, but use methods which might be stronger then what other group memebers would approve of. You once said in an interview that religious Jews don't want to be less "frum" than their gentile counterparts. I think you said this with respect to belief in evolution and how the rejection of evolution was in part an imitation of evangelical neighbors. I think analysis bears this out, at least to some extent. Is the extreme separation between men and women, at least in part, an imitation of our neighbors who follow mohommad? I.e. to show that we do not have "looser" morals than the mohommadans? If so, is would seem reasonable to expect that the results for the Jews would be the same as the results experienced by the mohommadans. argue is attributable to natural inclination. young Pashtun men are placed. There are other root causes of this phenomenon to be sure. But the implications of extreme gender segregation worry me. Would you agree that this seems a possible end-result? Student V - I agree, "womens' exlusion" is not the issue here. But general charedi attitudes to others, especially in Bet Shemesh, is very much the issue. And, speaking as a resident of Bet Shemesh, we need all the help on it that we can get. The police could simply have taken the brick away from her - they chose to act differently. It is interesting how wide the gap is in our "פרשניות". I was impressed by how restrained the police were in that incident. Here you have a woman wielding a dangerous weapon and screaming at the police, who are just doing their job! I would say they would have been justified to use much greater force against her, and arresting her was certainly called for. If that was an Arab approaching the police with a brick in his hand, would you expect them to behave differently? Why or why not? Your point is taken, but my point is that the Israeli police is violent, aggressive and don't know boundaries. To squabble over one particular incident is irrelevant. To be blunt, I find your approach appalling. Indeed, I accuse you in particular and the Haredi press in general for taking the mantel of martyrdom where contrition is called for. "Report them to the police"?! The zealots are standing in broad daylight and screaming their epithets in full view of the police and everyone else. Whatever do you mean?! "Don't count them in your minyan"?! You consider Rabbi Lippman naive, yet you propose this as a deterrent to the zealots. You think that their own shul isn't giving them shlishi on Shabbes? Sorry, Moshe, it is you that is harming the religious by refraining from speaking out against these outrages. If all the religious would condemn the zealots, then we would steal the thunder away from the anti-religious. So happy to have found your blog, Rabbi Slifkin. Great post. Yitz Waxman, loved your comment, "taking the mantel of martyrdom where contrition is called for." Exactly.